The newly weds and their 650 guests enjoyed a lunchtime reception hosted by Her Majesty the Queen. But was for lunch? All the ingredients for the more than 10,000 canapés prepared were sourced locally from the United Kingdom and from Royal Warrant holding companies, according to Clarence House. For a sweet ending, the couple sliced into an eight-tiered traditional fruit cake adorned with 900 iced flowers. The cake was designed by Leicestershire-based baker Fiona Cairns. A chocolate biscuit cake by McVitie's Cake Company was also served as a groom's cake, which was specially requested by Prince William. This Friday, the party starts at 5 A.M. The Royal Wedding joining England’s Prince William and his bride-to-be Kate Middleton kicks off at 10 A.M. on April 29 in England. The U.S.A. may not have a monarchy but that won’t stop many royal fans and Anglophiles from toasting the happy couple with eggs and bangers and a flute of champagne at one of these spots around town on Friday. "The Royal Wedding Sunrise Breakfast" at NYC Palace Hotel. At the NYC Palace hotel, the “Sunrise Breakfast” starts at 5:30 A.M. with tea service, coffee, personalized placecards and Brit-breakfast munchies including scones, marmalade and bangers and mash. To close out the morning, the hotel will have a champagne toast, at which point revelers can slink into their offices to work off the champagne, tickets $150. "Royal Wedding: William and Kate 4.29.11" under the archway in Dumbo. The show will start at 5:30 A.M. on Friday. A screen under the arches of the Manhattan bridge will transmit the BBC’s live coverage of the wedding. The party will continue as the rest of the Big Apple begins to wake up, with improv, face painting, dress up for kids, and more throughout the day. This event is hosted by the Dumbo Improvement District and is free. "Royal Wedding '11 Party" at the DUMBO Lofts. The Big Apple Brits (B.A.B.) hosts its own party from 9 A.M. to 1 A.M. across the street from the arch in the DUMBO Lofts. A $60 all-day pass gets you access to the open bar featuring English drinks—Pimms cups, ciders and champagne. The party will also re-play the wedding for those who couldn't make it at 5:30 A.M. and video clips from past Royal events. At 7:30 P.M., an evening party kicks off that will feature live music, (the open bar), raffles and more English snacks. $40 gets you into the evening party. "Greenwich Ave Street Party" between Lyon and Tea and Sympathy. The French and English set aside a long-standing rivalry on Friday in one corner of the West Village. The all-wedding all-the-time celebration on Greenwich Ave. is thanks to a collaboration between the French restaurant Lyon and the uber-authentic British teahouse Tea and Sympathy. A $39 breakfast featuring British favorites starts at 6 A.M. at Lyon Bouchon Moderne and at 9 A.M., Tea & Sympathy will welcome revelers with Morris folk dancers, bagpipes and a brass band going on throughout the day. If you’re looking for wedding merch, move quickly—Tea & Sympathy has been selling tea towels, mugs and the like for weeks and they're going like hotcakes. The London Candy Company's official grand opening is this Friday and guess what! It coincides with the royal wedding. Tea is on the house; guests will munch on cucumber sandwiches and have their photo taken with the princess. The party will start at 7A.M. with pastries and candy from England on sale. There will also be some Stumptown coffee for the non-tea drinkers! "The Royal Wedding Bash" at St. George’s Society. For enthusiasts looking to interact with actual British people, St. George's Society, a British-American charity, is hosting a benefit and fundraiser in the name of the Royal Wedding. The highlights from the three-course meal proudly speak the Queen’s English—they include bangers and mash, fish and chips, beef wellington and trifle for dessert. To raise money for the organization, there will be a silent and a live auction of items ranging from a behind-the-scenes tour of the Tower of London to the (now sold-out) Reiss dress Middleton wore in her engagement photos. But a warning, these tickets are not cheap. General seating is $150 and a table will run you $2,000. In the Edison Ballroom near Times Square. "Royal Wedding Viewing Party" at the Paley Center for Media. For those who would like to watch the Royal Wedding while discussing the social implications of the media circus surrounding it, the Paley Center for Media is the place to go. Tea, scones, champagne and a festival of bridesmaid dresses will be part of the celebration. (The zaniest dress gets a prize). The event is free, but interested parties must reserve tickets. Doors open at 5:30 A.M. This event is sold-out already! "Royal Wedding Live Screening" at the Trinity Wall Street Church. For the more pious set, the Trinity Wall Street Church in the Financial District will be opening its doors at 5 A.M. to any visitor who would like to watch live coverage. The parish may be in the heart of corporate America, but its ties to England go back centuries—to its founding in 1697. The event is free and open to the public. 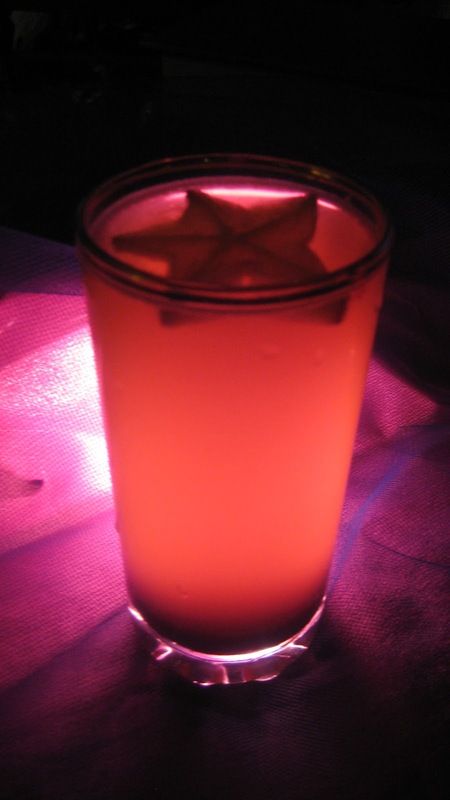 As a tribute to our night sky this drink will be the moonlight of your party. The ingredients include Blue Moon beer, blueberry syrup made from fresh blueberries, coconut water, blue agave, and soju. Soju is a Korean beverage made from rice and tastes excellent mixed with beer. It is slightly sweet and smooth and is comparable to vodka. Wash blueberries and add to pot with 3 oz of coconut water. Cover with lid and put on low heat. Cook till blueberries are broken up and liquid is thick and syrupy then turn off heat. Strain and place in a glass container then into fridge or freezer to cool. Place the cheesecloth over a strainer on top of a bowl. Pour the cooled blueberry juice over the cheesecloth and let it strain. This is a slow process and you can speed it up by squeezing the juice through manually. In a shaker combine ice, soju or sake, and coconut water and shake well. Pour Blue Moon about ¾ the way up glass. 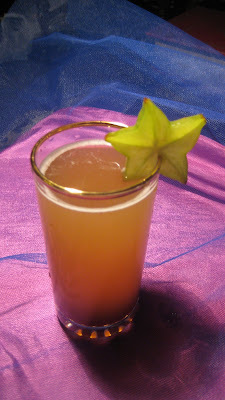 Pour in soju mixture and finish with two or three tablespoons of blueberry syrup. Garnish with a slice of star fruit with floating on top or standing on the tip of the glass. Serve in 16 oz glass of choice. If you were looking for a fun and festive way to Easter cooking, this may be your answer. It sounds like a child's dream come true: jelly beans replace vegetables, fruit roll-ups try their hand at being nori and imitation crab steps aside for the ultimate white food: marshmallows. 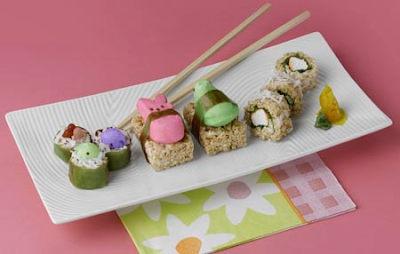 That's right, it's Peeps sushi, with all forms of potential nutrition removed, right down to the rice. The First Annual Varli Food Festival happened last night where curry smells and blended colorful tastes took over the Altman Building for nearly four hours. Guests had the opportunity to experience in first person flavorful, spicy and unique Indian foods from a number of local Indian restaurants and top chefs. Lentil donuts courtesy of Kamasutra Lounge, chicken kebabs, chicken Tikka and Tandoori, dal, fried okra and plenty of rice were some of the mouthwatering and often spicy samples offered to guests from Tamarind, Devi, Pranna, Chola and Tusli, Heritage of India and Bombay Palace restaurants amongst others. Brick Lane’s Samosas brought memories of my days in London where those spicy, pyramid-shaped pastries stuffed with potatoes or ground meat were abundant in corner shops and street vendors. Notable were the beet and spinach Naan – the traditional Indian bread as they call it, similar to pita. But the most innovative and unique sample dish of the night was the Indian sushi, an intelligent culinary invention that took everybody by surprise. A selection of chicken Tikka, chicken Schezwan or Chilli Paneer sushi, all nicely looking, were even better in the palate. Add some Lassi –the refreshing creamy yogurt drink and your night was complete. The ground floor was for the sweet lovers: plenty of candied ginger, Indian cakes and spiced desserts were there for guest to try. This well-designed event produced by Varli Magazine that was sold-out, featured an exclusive performance by celebrated Indian songstress Tina Sugandh and some of the top Indian chefs included Vikas Khanna, Jehangir Mehta, Floyd Cardoz and Hemant Mathur. The event’s objective was to bring Indian cuisine and culture to the forefront of mainstream consciousness so guests were invited to browse the Festival’s special Spice Market, where they received an exclusive Varli Food Festival tote bag and selected various Indian spices, chutneys, rice, flour, juices, teas and snacks to bring home. Let’s hope that we will see some corner shops selling pakoras and samosas soon! Tali: a selection of different dishes, usually served in small bowls on a round tray. The round tray is generally made with steel with multiple compartments. Typical dishes include rice, dhal, vegetables, chapati, papad, curd (yoghurt), small amounts of chutney or pickle, and a sweet dish to top it off. 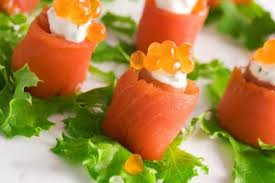 It is very similar to assorted appetizers from the European South or the Bento Box of Japanese cuisine. And for the record, five are the basic spices of the Indian cuisine: mustard seeds, cumin, coriander, turmeric and cajun pepper, all or some of which constitute the curry powder. Curry, when used alone, means stew or soup and is rather the westernized term pointing at a spiced dish. In Britain, "go out for a curry" means: "go to an Indian restaurant".